The KNORR Béarnaise sauce is just as adaptable as the KNORR Hollandaise. 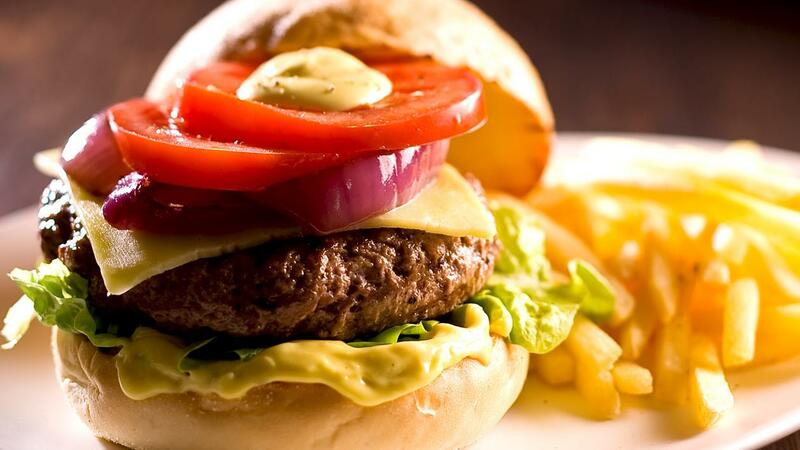 By adding cheese to the KNORR Béarnaise or a creamy cheese burger sauce. Preheat the oil in a frying pan and pan fry the fine diced onion until cooked without colour, remove then set aside. In the same pan lightly fry the sliced onions until golden brown remove, set aside for use and keep hot. Combine beef mince, beef sausage mince, cooked onion, COLMAN'S Dijon mustard and pepper. Mix together well. Shape mince mixture into (160 g) burger patties. Grill, pan fry or BBQ beef patties to desired liking. Place the KNORR Garde D’Or Béarnaise sauce into a pot and heat. Add the grated tasty cheese and allow to melt, set aside and keep hot. Wash and slice the tomatoes, wash and drain the lettuce. Slice the burger buns and toast. Assemble the burger in the following order - Toasted bottom burger bun, cheese sauce, lettuce leaves, cooked burger patties, sliced cheese, red onion, tomato and finally top burger bun. Serve with freshly cooked shoestring fries.